ABA Law Student Division Chair Negeen Sadeghi-Movahed speaks to the ABA House of Delegates at the midyear meeting in Las Vegas on Jan. 28, 2019. 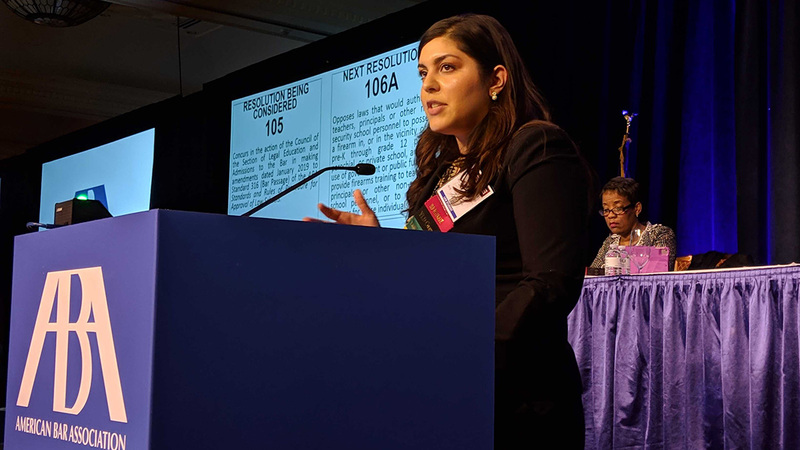 Law Student Division Chair Negeen Sadeghi-Movahed spoke in opposition to Resolution 105 to the House of Delegates at the ABA Midyear Meeting in Las Vegas on Jan. 28. Resolution 105 asked for approval of changes to Standard 316 by the Section of Legal Education and Admission to the Bar. 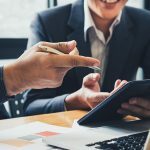 The changes would have required “at least 75 percent of a law school’s graduates in a calendar year who sit for the bar examination must have passed a bar examination within two years of their date of graduation” instead of the current time of five years. The resolution was rejected in the House of Delegates by a vote of 334-88. 1. The Council was concerned that the proposed change could adversely impact minority students through the overreliance on traditional predictors like the LSAT for admission into law school, thereby making our law schools and the legal profession less diverse. 2. The proposed change could penalize law schools who enroll students that may not pass the first time and cannot subsequently take the bar exam due to financial obligations or military deployment during the two-year time frame. 3. The proposed change could have the potential either to discourage prospective law students with average or below-average LSAT scores from entering the legal profession or to discourage law schools from accepting applicants with lower LSAT scores. 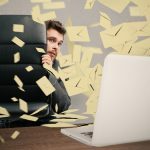 The LSAT is not the best predictor of whether a student will pass the bar exam; law school grades are a better indicator. 4. The Section for Legal Education and Admission to the Bar failed to address the concerns expressed the first time the resolution was put forth to the Council’s satisfaction. 5. The proposed change could disproportionately affect California law schools and states with only one or two law schools. 6. Despite the goal to eliminate predatory law schools, the Council believed the Section has failed to account for or recognize the potential effects of the changes to Standard 316 will have on diversity in the profession. Special credit should be given to Law Student Division Delegate of Diversity Miosotti Tenecora and the Diversity Committee for leading the charge and advocating for minority students and diversity of our profession. 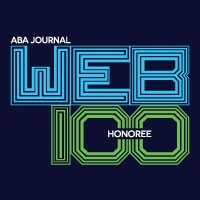 Groups that also opposed resolution 105 included: the ABA Young Lawyers Division, the HOD Minority Caucus, the Clinical Legal Education Association, the Society of American Law Teachers, the National Black Law Students Association and several law school deans and student bar association presidents. Ashley N. Baker Ashley N. Baker is Delegate of Communications, Publications, and Outreach for the ABA Law Student Division. She is also a 2L at Southern University Law Center where she holds memberships with the Journal of Race, Gender, and Poverty, the Board of Student Advisors, and The Public Defender Newspaper.